Milton Friedman has the two solutions to the Black Teenage Unemployment Problem!!! Milton Friedman has the two solutions to the Black Teenage Unemployment Problem!!! The solutions would be first to lower the Minimum Wage Amount and second give students the opportunity to have vouchers so their parents can put them in the best schools when they start in the kindergarten so when they finish the 12th grade they will be ready for college!!! We got to give Milton Friedman’s voucher system a chance!!! On the late, great, Nobel Prize–winning economist Milton Friedman’s 101st birthday, it is fitting to remember his legacy of school choice and continue the fight for educational opportunity he left for us. “A stable and democratic society is impossible without widespread acceptance of some common set of values and without a minimum degree of literacy and knowledge on the part of most citizens. Education contributes to both,” Friedman once remarked. Friedman knew that education is essential for a free society to flourish, but he understood that government-administered schooling is not the way to achieve quality educational options for all children. Friedman was the father of the educational choice movement, which he first conceived through the idea of school vouchers. The Friedman philosophy of education promotes educational opportunity where parents are free to choose an education that best meets the needs of their children, with money following the children to any schools of their choice: public, private, charter, virtual, or home school. Choice releases children from government-run schools assigned to them based on their parents’ zip codes. Options such as vouchers empower parents to choose better alternatives for their children’s education. Choice improves the amount of educational options available to families and promotes competition, applying economic pressure that can lead to better performance in the public system as well. Friedman knew that educational choice is a win-win solution for everyone. Friedman’s legacy of educational choice continues to expand. Several states now have a plethora of educational options: school vouchers, tax credits, charter schools, online learning, and education savings accounts (ESAs). ESAs have especially refined Friedman’s original concept of a school voucher. A family with an ESA can use 90 percent of the per-child amount of state funds that would have gone to the child’s assigned public schools to instead be deposited directly into an ESA in the child’s name. The money in the savings account follows the child and can be used by parents to finance a variety of education-related services and providers. They can, for example, use their ESA funds to pay for private school tuition, online learning, special education services, and educational therapies—all while saving taxpayer money. It is an educational option that would have made Friedman proud. Although educational freedom continues to grow, there are still millions of children around America stuck in low-performing schools. The purpose of vouchers is to enable parents to have free choice, and the purpose of having free choice is to provide competition and allow the educational industry to get out of the 17th century and get into the 21st century and have more innovation and more evolvement. In 2013, America faces a fork in the road: One direction is toward educational freedom; the other is toward increased centralization through one-size-fits-all efforts such as the Common Core national standards. In honor of Friedman’s birthday, we must rededicate ourselves to the unfinished task remaining before us, the true end of his philosophy of educational choice: educational freedom in America. 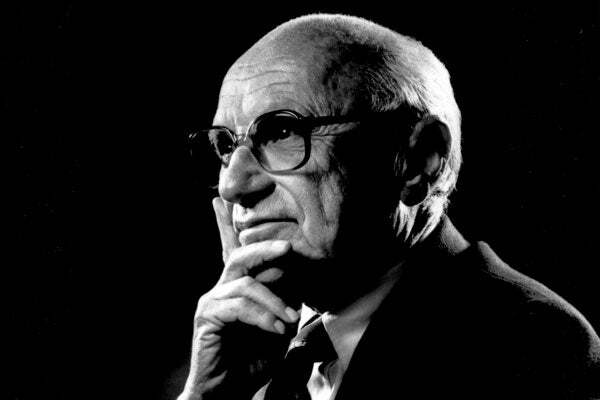 FRIEDMAN FRIDAY Milton Friedman Quotes and Videos!!! If Milton Friedman was here he would attack Trump’s proposal for a 45 percent tax on Chinese products! Milton Friedman destroys Donald Trump on issue of PROTECTIONISM!!! While attacking TRUMP Larry Elder quotes Milton Friedman concerning Protectionism!!!! “Friedman Friday” Milton Friedman videos on medical care!!! Milton Friedman bragged on Hong Kong’s free economy in 1980 and Dan Mitchell does in 2016!!! « FRIEDMAN FRIDAY Milton Friedman Quotes and Videos!! !